The cost of the project to build the Southern Bypass around the Cambridgeshire city of Ely has increased by £13m - a third of its original budget. The county council said construction is progressing well, with several milestones reached. However, it added that working under tricky conditions such as building on a floodplain and near a national heritage site meant that costs have increased by £13m, which it was working with its contractor (VolkerFitzpatrick) to minimise. The project was originally expected to cost around £36m. 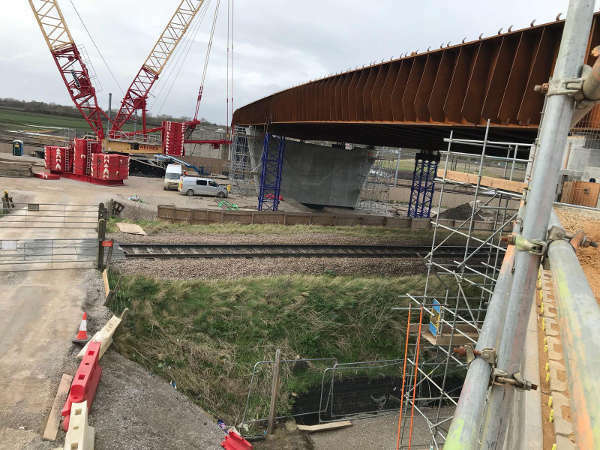 Cllr Ian Bates, chairman of Cambridgeshire County Council’s Economy and Environment committee, said: ‘Ely Southern Bypass has been a much wanted scheme for more than 20 years and there is no doubt it will ease congestion in Ely. ‘We all took the brave decision to procure the contract early to get the scheme off the ground and the cost of the scheme is the reality of building in such a difficult area. The bypass is being built across an area of poor ground conditions, which the council said ‘have been even worse and more unpredictable than expected’. Building across a flood plain and poor fenland soils has resulted in large amounts of additional work and material being needed. The depth of the foundations for the river viaduct is two thirds the height of the Cathedral – much more than expected. Also, as Ely Cathedral is a national heritage site, a unique, specially designed viaduct needed to be created, ‘which has given the team significant challenges’. The eastern, central and western embankments have been built while the abutments, which is where the bridge starts and ends, and the central pier over the railway are also complete. The steel beams, weighing up to 350 tonnes each, which form the bridge decks have been lifted into place. The new route will remove the need for heavy goods vehicles to use a railway level crossing, and avoid an accident-prone low-bridge. The viaduct will include a separate walkway allowing the public to cross the river. The road is expected to open in October. Once the bypass has opened, the existing underpass at the low bridge will be improved for pedestrians and cyclists. The project has been funded by Cambridgeshire CC, East Cambridgeshire DC, Network Rail and the Greater Cambridge Greater Peterborough Local Enterprise Partnership grant - £22m Growth Deal, including £16m from the Department for Transport.